After weeks of internal deliberation, President-elect Donald Trump officially announced that former Marine General James N. Mattis will be his nominee to lead the Defense Department. Gen. Mattis was never really in question for the position; through his Twitter account and his public statements to the media, Trump had nothing but positive things to say about the man who helped direct Operation Phantom Fury in Fallujah, a battle that was accompanied by the most intense urban combat for the Marines since the Vietnam War. While Gen. Mattis oversaw all U.S. military operations in the Middle East and Southwest Asia for three years, a difficult mission to say the least, ensuring the gigantic bureaucracy known as the Pentagon is operating smoothly will be significantly more challenging. Assuming Congress grants the necessary waiver for him to serve as Defense Secretary after his long career in the military, Mattis will step into the Pentagon as the juggler responsible for fulfilling a variety of tasks -- dealing with lawmakers; safeguarding the resources for the department's readiness accounts; counseling the president on defense matters during National Security Council meetings; building a positive relationship with other national security agencies and departments; and preparing for all contingencies the U.S. military may need to confront in the future. Being the Secretary of Defense is an arduous and grim responsibility, particularly during a time of war (current active U.S. military operations span at least seven countries). But Secretary-in-waiting Mattis has a wealth of history from his predecessors that he can use to prevent committing mistakes that have plagued some of his predecessors. 1. Working with Congress ain't easy: Being Defense Secretary not only means being an advocate for the troops in the field and the employees in the department, but also being a cheerleader for the department's priorities. But none of those priorities, programs, or reforms can happen without cooperation from the men and women in Congress who authorize and appropriate funds. A poor relationship with Congress, especially with members of the House and Senate Armed Services Committees who oversee the Pentagon and authorize what programs the department can implement every single year, is a guarantee that a Defense Secretary's tenure will end quickly. An adversarial relationship with the department's legislative overseers can often mark the difference between a successful tenure and a rocky one. Fortunately for Mattis, he is highly regarded on Capitol Hill. Sen. John McCain, the Chairman of the Senate Armed Services Committee, described Mattis as "one of the finest military officers of his generation and an extraordinary leader who inspires a rare and special admiration of his troops." Sen. Jack Reed, the ranking member of the Armed Services Committee, is equally effusive in his praise of the former general: "It is clear that General Mattis is a respected Marine and strategic thinker who served with honor and distinction." It is incumbent upon Mattis, if indeed he is confirmed to his post, to use those personal relationships in order to push through needed reforms in how the Pentagon does business. 2. Speaking about reforms: Defense Secretaries across administrations have attempted to convince Congress that the Pentagon needs to begin shuttering or downgrading bases across the country that either have no military value, don't match up to the current composition and size of the U.S. Armed Forces, and are draining resources from more important parts of the department's budget. Since 2005, Congress has prohibited a new round of Base Realignment and Closure (BRAC) through annual authorization bills. This year is no different; included in the National Defense Authorization Act conference report that was just negotiated, the Armed Services Committees included a provision that forbids any money from being used towards even studying the closing of infrastructure the Pentagon believes is unneeded and wasteful. In an April 2016 letter to the Armed Services panels, Deputy Defense Secretary Bob Work wrote that a Pentagon study estimated the department's needs and ends simply didn't match up. "Absent another BRAC round," the study assessed, "the Department will continue to operate some of its installations sub-optimally as other efficiency measures, changing force structure, and technology reduce the number of missions and personnel." The Pentagon calculates that shedding unused and unneeded defense infrastructure would save the Pentagon $2 billion a year, money that could be transferred to other areas of the department's budget to boost readiness after a decade and a half of continuous war. As a military man with decades of experience as a wartime commander, Mattis has the credibility and prestige to advocate for this ultimate reform on Capitol Hill. 3. Don't overextend America's military: Much of Mattis's tenure at the Defense Department will of course be determined by the type of national security policy that President-Elect Trump will formulate in the weeks and months to come. Trump's aversion to the regime change and nation-building missions of the past is a good omen for realists who have long argued overthrowing government's the U.S. finds unsavory does not advance America's vital national interests -- particularly when Washington is unprepared for the governance and security void and his left holding most of the war-related costs. As is too often the case, regime change missions packaged as quick and easy military victories (i.e. Iraq 2003 and Libya 2011) either degenerated into occupations that lasted far too long or fomented sectarian and civil conflict that destroyed the possibility of a democratic transition. As the top defense official in the president's ear, Mattis has a unique opportunity to drill home the message that overextension of the U.S. military -- using military power to solve national security crises that can only be resolved politically by the combatants themselves -- will effect the health and capacity of the joint force long into the future. General Mattis has had an extraordinary career in the service of his country. 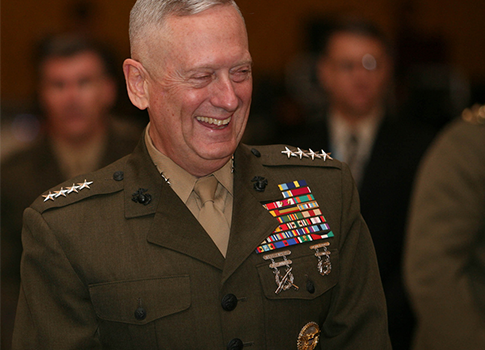 If the Senate confirms his nomination, Mattis will be called upon to serve the United States yet again after 41 years in the U.S. Marines -- except this time, he will be a civilian in a suit rather than a general in military fatigues.